These days news about the economy often seems pretty dreary. With companies offshoring many jobs to places with lower wages or standards, and those that remain being “rightsized” away, it feels like no-one can get a decent salary anymore. Yet some businesses overcome this trend, and demonstrate that innovation is truly the key to success and prosperity, and sometimes a local business leads the way. Reaching the top of the computer service industry. Such is the case with Northern Protocol. Founded by Aaron Weston almost 20 years ago as a one-man jack-of-all-computer-trades outfit, since 2007 this Barrie operation has grown exponentially. That was the year Aaron decided to turn his part-time home-based occupation into a serious concern. A forward-looking landlord offered Weston 6-months rent-free in a vacant office space at Bayfield & Ferris and the gamble paid off, not only succeeding and paying rent but within 3 years upgrading to double the space. Now with fully-operational satellite offices in Stayner and Alliston, and a total payroll of over a dozen full-timers, Northern Protocol has vaulted past their competitors and is on the verge of possible franchising. But what innovation led to this success? It isn’t some better way to remove viruses, maintain and clean up cloggy old systems, recover lost data, or backup and reload, all services available for PC or Mac at flat rates. It isn’t because NP’s employees have special technical skills other support firms don’t, although they certainly don’t lack talent. And it’s certainly not a colourfully-wrapped compact car with the cheeky promise of smart nerds attending your site. No, the innovation has been in the style and quality of service provided. I discovered this quite by accident, feeling unsatisfied with the service from another local computer doctor. After paying to have my problem diagnosed, then paying again to fix it, my computer came home and within the week the original problem recurred, despite my depleted wallet. Then I encountered, either on the radio or their billboard, Northern Protocol’s trademarked promise “We fix it or it’s free”. It struck me like a beam from the heavens: that’s what I need, never again paying to “fix” my computer even if it wasn’t fixed. I got that, and more. My home-business laptop frozen, I was in quite a pickle, with work coming in on a 48-hour turnaround. I brought it to NP on a Saturday morning, then spent the rest of the day on family activities. Sleeping in Sunday morning, I was awoken by Weston himself, delivering my computer which he had fixed the night before, with no special delivery or rush charge! The problem was actually fixed and my work reputation was saved. 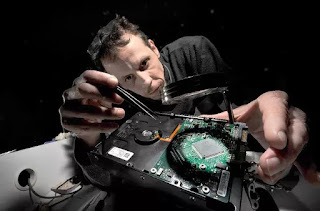 A new angle on computer repair. Like many computer repair shops, you can bring in your machine or they can work at your location on an hourly basis. But the added value is free pick-up or drop-off from your home in the Barrie area, which gets you the lower in-shop rates without having to drag your equipment back and forth. You can also trust NP to recommend or sell you new equipment, off-the-shelf or customized to your specs, as they only carry or endorse quality brands you can rely on to do what you need. And with a responsive Facebook page, you can get helpful updates or have your own queries addressed by real people, not faceless bots. This is a quintessentially Barrie tale. Our community is very supportive to small and growing businesses, and you may have read elsewhere of Aaron’s personal streets-to-entrepreneur story. It’s a love that’s returned, through NP’s support for the David Busby Street Centre, Salvation Army adopt-a-family, COPE Dogs and the Jazz & Blues festival. So next time economic news gets you down, think about thriving, innovative local businesses like Northern Protocol and take heart! Published as my Root Issues column in the Barrie and Innisfil Examiners as "Some local businesses are very innovative"
Erich Jacoby-Hawkins serves on the board of Living Green and the Robert Schalkenbach Foundation.